A couple years ago, I read Timothy Ferriss’s The 4-Hour Work Week. In addition to the entertaining stories Tim tells, two pieces of advice stuck with me: 1) find a market before creating a product, and 2) intellectual products are the best, because they are harder to replicate/outsource. When I realized that I was listening to the audiobook more for entertainment than for business advice, I finally realized when I should be doing: writing my OWN success story, a fictional one. I had the market (the Web is full of people wanting more case studies and success stories) and I had the writing chops (former English professor here). The rest is history. Jerrod Beams came to me first: a career civil-servant, nice guy, “successful,” but vaguely aware that something was off. My short time in government service made creating this type of main character natural, as did Tim Ferriss’s description of the comfortably bland lives that can be so destructive and insidious. Jerrod’s wife, Janice, followed. As a family man and confirmed suburbanite, Jerrod needed a stumbling block at home, someone to “pump the brakes” when he tried to create his own business. Janice fills that bill, but there’s more to her than meets his eye. The other characters grew organically from the story. A graduate of the U.S. Naval Academy, Washington College and the Catholic University of America, J.F. Hussey’s professional endeavors have included driving ships, professing English, teaching sailing and assisting political appointees. His writing reflects his wide interests and his abiding concern for the crushing effects of modern life, and celebrates the heroic lengths to which some will go to reclaim their birthright to happiness. A native of Maine, J. F. Hussey now lives in Annapolis, Maryland, enjoying the long sailing season and ever-so-short ski season with his five children. You can learn more about his writing and see updates about current projects at his website, www.jfhussey.com. 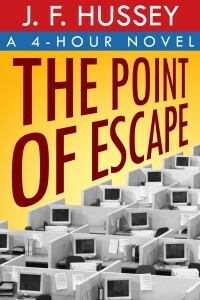 The Point of Escape is available on Kindle Unlimited. Also, through midnight today (August 1, 2014), you can download it free!